Playing Powerball or Mega Millions in a syndicate group is a must - those odds are as tough as a $2 steak! But all US lottery game are easier to win when you play in a group of course. Read more about the games themselves below, or jump straight in to the reviews here. LottoLand Syndicates LottoLand has been taking the UK, Europe and Australia by storm. And now they have some impressive syndicate options for those big US games too. LottoLishus Not your usual kind of lottery pool. But these guys do offer a convenient way to play the big games online. WinTrillions Powerball and Mega Millions Syndicate A 'big draws' syndicate covering the big US games plus Italy's huge SuperEnalotto all in one package. Florida Lotto Magic A decent syndicate with some great extra bonuses worth more than the membership fee! Plays Florida Lotto, Powerball and Mega Millions too. The USA is a complicated place sometimes. 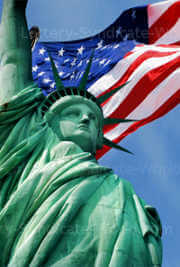 On the one hand it is land of the free, home of the brave etc. But on the other, for those who live in the USA it is extremely difficult to play with any company based outside of the US. That's the US Government blocking them, not the other countries! Options are better for everyone else. This is one of the reasons why this list is quite short - the other is a lot of syndicates getting caught in the Bush crossfire in 2007. There are 38 US states currently allowed to run lottery games. Most also run their own lottery games, but the big multi-state Powerball and Mega Millions games continue to draw huge interest due to their vast jackpots. Nearly $18 billion in profits were raised directly from lottery games in the fiscal year 2009, providing a valuable contribution to state income and funding for everything from Health and Welfare to Education. The largest prize to date was won by a Powerball syndicate of 13 machine shop workers in Ohio. They shared a lump sum payment of $161,496,959 - that's over $12 million each! The idea is simple. Instead of buying individual tickets, everyone pools their money to buy tickets together. The winnings are then shared equally. The more members involved, the more tickets you can buy - and of course the better your chances of winning. The flip side of course, is the more members you have, the smaller the share of the prizes. This balancing act is important. Many offices or groups of friends run their own small syndicate - and you can get more help on doing this in lottery pools and how to start a lottery syndicate. This can be great fun, but sometimes your employer won't approve, or you just don't have enough people. And this is where the online USA lottery syndicates come in - they take care of building the group, managing the tickets plus claiming and distributing the winnings. If you're wondering why there aren't more USA lottery syndicates online, it's partly related to concerns over the definition of 're-selling' tickets. Only authorised vendors may sell tickets in the USA, and although a lottery syndicate never sells you tickets of course, organisers appear discouraged. What Happened To All The USA Lottery Syndicates? UPDATE: Things now look pretty bleak for US online syndicates. 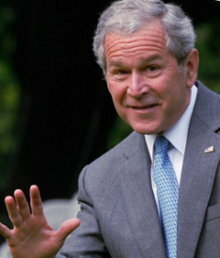 President Bush's 'anti-internet gambling' law introduced back in January 2007 seems to have effectively killed off most of the small syndicate operators in the US. And most operators in other countries are reluctant to accept US players too. It wasn't what this legislation was intended to do, but lottery pools just got caught in the crossfire. It does seem a fairly crazy situation that it's OK to have an entire city based purely around gambling (Las Vegas), massive state run lotteries in nearly every state in the country - yet running a lottery syndicate via the internet is a bad thing..!? Write to your Senator folks! Despite the crazy odds, these two big multi-state games remain incredibly popular in the USA - due of course to the enormous rollover jackpots they produce. Both games have changed formats numerous times over the years. The range of main numbers has changed, as has the range of Power/Mega balls - in every case making the jackpot harder to win in what seems a constant competition to have the biggest rollover jackpots. The ticket price was also increased for Powerball on 15 January 2012 from $1 to $2. While it still remains at $1 for Mega Millions (with no published plans to change) - this is important to remember when comparing games. You can effectively double all the odds for Powerball to get a fair dollar for dollar comparison. Which does make these two of the hardest games in the world to win. 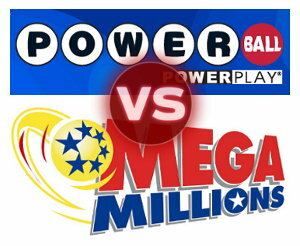 Making a Powerball or Mega Millions syndicate a very good idea if you want to try your luck at those jumbo jackpots. The crazy prizes that drive the popularity of these two games are pretty much always in the $100M+ range, commonly hit $200M+ and have been setting records in excess of $300M for the past couple of years. The record jackpot is currently held by Mega Millions. It stands at $656M claimed by 3 ticket holders in March 2012. 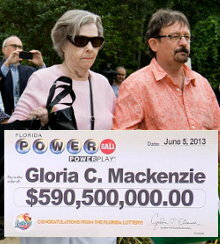 But Powerball came close in May 2013 with a $590.5M jackpot - but this one was claimed by one single ticket, bought by Gloria MacKenzie in Florida. It is important to remember that lottery jackpots in the USA are actually annuity payments. If you choose to receive a lump sum cash payout instead (which most people do) then you typically receive around half of the headline amount. Prizes in the USA are also taxed in most states. There are of course many others lottery games played across the USA. But each state has it's own lottery company which run their own games. You will find the same types of games available in each state, as the well known format of Pick 3, 4, 5 and 6 crop up under various different names. Each US state has it's own official dedicated website. But there are also official sites for the big Powerball and Mega Millions games too, where they also provide links to each individual state lottery site. 13 Jul 2014 Kimberly-Clark group win $1M - each receives $48,500 after taxes. 29 Jun 2014 Rolls Royce based syndicate win $1M on Powerball. 11 May 2014 $414 Million jackpot split by winners in Maryland and Florida. 24 Feb 2014 Bethlehem city park workers pool split a $1M win. 26 Jan 2014 The 'City Haulers' collect $1M from Mega Millions 13th Dec draw. 4 Dec 2013 A UPS group based in Louisville, Kentucky pick up another $1M win. 24 Nov 2013 Another big $1M prize - this time 41 workers from the The Newcan Company who bought 177 tickets between them. 3 Dec 2012 Biggest Mega Millions Jackpot Ever - we know this game rolls over a lot, but just how big can it get? 10 Aug 2011 Ohio Syndicate win Friday's $99 Million jackpot. Powerball Lottery News - more info and winners stories for the big US Powerball game. Mega Millions Lottery News - winners stories and more for Mega Millions. Texas Lotto Club A decent syndicate option if you want to play 'Lotto Texas'. Lack of transparency may concern some. Lottery Pools Win A straightforward amateur Mega Millions syndicate. YoYo Lotto Pool Plays the California Lottery, New York Lottery and Mega Millions. But makes exactly the same mistakes as the recently demised Xzotto. Xzotto.com The lottery pool that isn't. Xzotto is a confusing mess with little of any value to offer. Group Play A passable system tailored more toward infrequent group lotto entries. Lotto Busters Club Tennessee based Powerball syndicate, nicely done. Worth a look. Virtual Lottery Pool Decent Powerball pool with no charges at all. Big Powerball Pool Well balanced pool at a good price. '20 Chances' A decent syndicate marred by small group sizes, and just too expensive to recommend. Heron Aerospace Lottery Pool A very low cost New Mexico based pool playing the Powerball.